Vega (α Lyr, α Lyrae, Alpha Lyrae) is the brightest star in the constellation Lyra. It is the fifth brightest star in the night sky and the second brightest star in the northern celestial hemisphere, after Arcturus. At only 25 light-years from Earth, it is a relatively close star and one of the most luminous stars in the Sun's neighborhood. Vega has been extensively studied by astronomers: this led it to be called "arguably the next most important star in the sky after the Sun". Vega was the northern pole star around 12,000 BC and will be so again around the year 13,727. Vega was the first star other than the Sun to be photographed and the first to have its spectrum recorded. It was one of the first stars whose distance was estimated through parallax measurements. 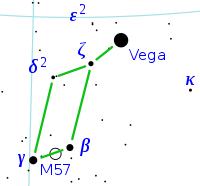 Vega has served as the baseline for calibrating the astronomical brightness scale. Vega is only about a tenth of the age of the Sun, but since it is 2.1 times as massive its expected lifetime is also one tenth of that of the Sun. Both stars are at present near the midpoint of their life expectancies. Vega has not much of the elements heavier than helium. Vega is a suspected variable star that may vary slightly in magnitude in a periodic manner. It is spinning rapidly with a velocity of 274 km/s at the equator. This is causing the equator to bulge outward because of centrifugal effects, and, as a result, there is a variation of temperature across the star's photosphere that reaches a maximum at the poles. From Earth, Vega is being observed from the direction of one of these poles. Based on an observed excess emission of infrared radiation, Vega appears to have a circumstellar disk of dust. This dust is likely to be the result of collisions between objects in an orbiting disk of debris, similar to the Kuiper belt in the Solar System. Stars that display an infrared excess because of dust emission are termed Vega-like stars. Irregularities in Vega's disk also suggest the presence of at least one planet, likely to be about the size of Jupiter. ↑ Gulliver, Austin F; Hill, Graham & Adelman, Saul J. 1994. Vega: A rapidly rotating pole-on star. The Astrophysical Journal 429 (2): L81–L84. This page was last changed on 18 April 2019, at 18:18.